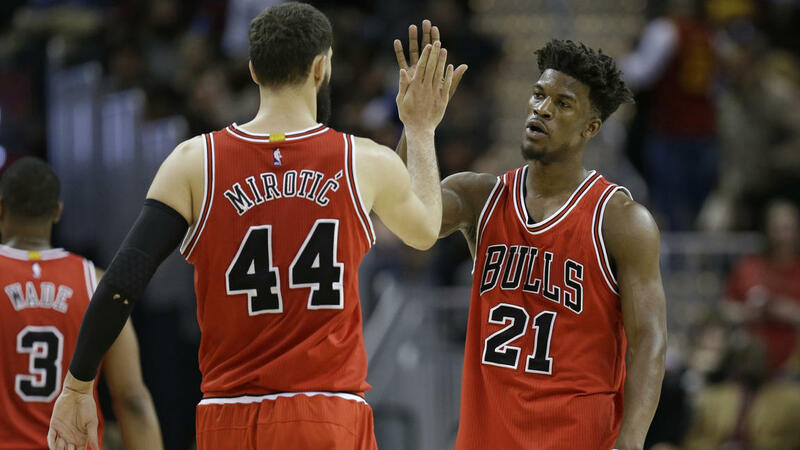 Tony Dejak / AP Bulls forwards Nikola Mirotic and Jimmy Butler celebrate late in the second half. It was a feel good win for the Chicago Bulls on Saturday night as they beat the Cleveland Cavaliers (sans Lebron) 117-99. The Bulls have now won four straight games and are 5-1 against the top two teams in the Eastern Conference. The Cavaliers were without Lebron James, Kevin Love, and J.R. Smith, so any conclusions drawn from this game would be irresponsible. However, we know how much the Bulls management loves to talk about their record against the top Eastern teams, and this win will serve as another arrow in their media-spin quiver. Jimmy Butler had a quiet first half scoring-wise, recording only three points. He managed seven rebounds and seven assists, however, and he turned it on when it mattered, finishing the game with 18 points, 10 rebounds and 10 assists, his third career triple-double. Fellow Alpha Dwyane Wade led the Bulls in scoring with 20 points, and was only one rebound shy of his own triple-double. He would have gotten it too, if it weren’t for that meddling Cris Felicio. Robin Lopez, Rajon Rondo, Nikola Mirotic, and Cristiano Felicio all contributed to the win with double-figure scoring efforts. The big story of the night was 3-point shooting for the Bulls. Setting a new season high, the Bulls sank 15 3-pointers. This surpassed the previous record of 13, which Chicago set against the Cavs back on January 4th. This is especially encouraging for the Bulls since their best 3-point shooter, Doug McDermott, got traded to the Oklahoma City Thunder just two days before the game. With 15 made 3s last night and 12 made 3s the night before against the Suns, Chicago made double digit 3-pointers in consecutive games for just the second time this season. We know full well by this point that inconsistency is the only constant for this Bulls team, so who knows if this sweet shooting will continue on or disappear as quickly as it appeared. Hopefully with rookie Denzel Valentine getting more minutes, he can develop into a reliable shooter from long range. We also got our first look at new Bulls Cameron Payne and Joffrey Lauvergne in Saturday night’s win. Payne, who played only 12 minutes, sank two 3-pointers and recorded two turnovers in pretty quick succession. It’s tough to draw any real conclusions about Payne from just 12 minutes, especially since he didn’t even play all of those minutes at point guard, so all I’ll say is that if this guy is the centerpiece of your trade, I hope you give him a more extended look going forward, regardless of how well your 31 year old veteran is playing. Lauvergne was on the floor for only two minutes in the third quarter. He was quickly replaced after a defensive slip-up led to a Richard Jefferson dunk. If there’s one thing we know is good for player development, it’s an unreasonably short leash that causes them to look over their shoulder constantly and not try to push the boundaries of their abilities. Bobby Portis looks to be an example of a player whose leash is lengthening, which is encouraging to see. Portis got another start at the power forward position, and made his first shot, then missed five in a row, then made one more to round out his evening. He continues to look both dazed and confused on the defensive end, often scrambling to try and get into position only to realize that the possession has passed him by while he was trying to get his bearings. We continue to receive more and more evidence that he can’t play the 5 defensively, but he does seem to be slightly more comfortable on the offensive end. If Portis keeps playing this many minutes, we should have a good idea about him by the end of the season. The Bulls will try to record their fifth straight win as they take on the Denver Nuggets next at home on Tuesday night. The team here at Bulls Confidential will be here until then to keep you posted on all things Chicago Bulls.